The default wikidot editor is black text on a white background. But by using custom CSS you can change the title, main editor panel and short description panel to different colours, fonts, borders and other elements. You can also change the dialog box that comes up when you save a page and even the animation during the save process. You will need to know how to alter the CSS (custom style sheets) on your wiki. 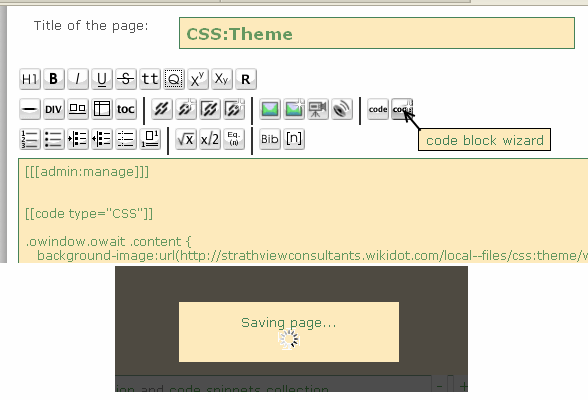 Wikidot recommends that you create a page, perhaps called css:theme, where you enter your CSS. Then in the admin:manage page go to Appearance -> Custom Theme and create your custom theme. If you have already created one you can select edit. Select the default theme you are extending then scroll down and press Import. Enter the name of your css file, e.g css:theme, and then save changes. Then go back to Appearance -> Themes, click on _default and from the dropdown menu select your custom theme then click on the Save Changes button. When you go back to another page in your wiki it will now be using your custom theme. That was only a brief introduction to creating your custom CSS page. In the links below there is a more detailed description. In the editor you have a title, main text entry panel and a smaller panel to give an optional short summary of the changes you have made. If you think this solution is useful — rate it up! Or dump it otherwise. Is there any way to remove the buttons? i.e. only show the Post title and main text entry area? We're designing a new comment user interface that has no buttons and is simpler to use. In the meantime, RobElliott's solution is a nice one. It's a bit hard to test without seeing your site in my browser - I had a look but they're both private. I'll see if I can figure it out using one of my own sites. Will reply back here if I have any suggestions. The !important modifier prevents any definitions from further down in the CSS from modifying it (unless they have !important as well).